Have you heard of the Coastal Slope Trail? The Malibu Public Access Enhancement Plan is a joint effort of the Santa Monica Mountains Conservancy and the Mountain Recreation Conservation Authority. The Plan proposes to develop a parking lot at Kanan Dume Road and complete a portion of the Coastal Slope Trail extending from Kanan to Corral Canyon park. Overall, the Coastal Slope Trail is envisioned to connect Los Liones Trail in Topanga State Park to Pt. Mugu in Ventura County. Would you like to enjoy this mid-slope trail with views of the coast? 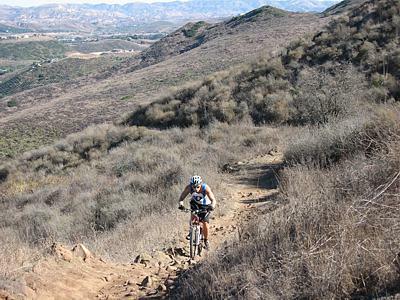 The mountain biking community needs representation at a public meeting this Monday night (11/20/06) at Webster Elementary School in Malibu at 7:30pm (Here's the link for more information: http://www.smmc.ca.gov ). It is important for mountain bicyclists to come and say that we need more multiple use trails with views of the coast and that this could be the only opportunity to have a contiguous coastal trail created. The meeting begins at 7:30pm, public testimony begins at 8:00pm and is done by 9:00pm. Pleas invest a couple of hours now for years and years of great coastal trail riding.